I was digging around in the bottom of the fridge when I came across a tub of pizza dough. A quick check of the freezer found that I didn’t have any pizza sauce. And no ‘normal’ pizza toppings in the fridge, either. Well, I figured that this was the opportune time to make a breakfast pizza. I can’t say I went into the project with great optimism. Well, I’ve been wrong before. This breakfast pizza was easy to make and came out tasting fantastic. It was a welcomed twist on a regular ole pizza. Of course you can add more toppings. Such as crumbled cooked breakfast sausage. Roasted red bell peppers. Salsa. Hot sauce. Jalapeno slices. 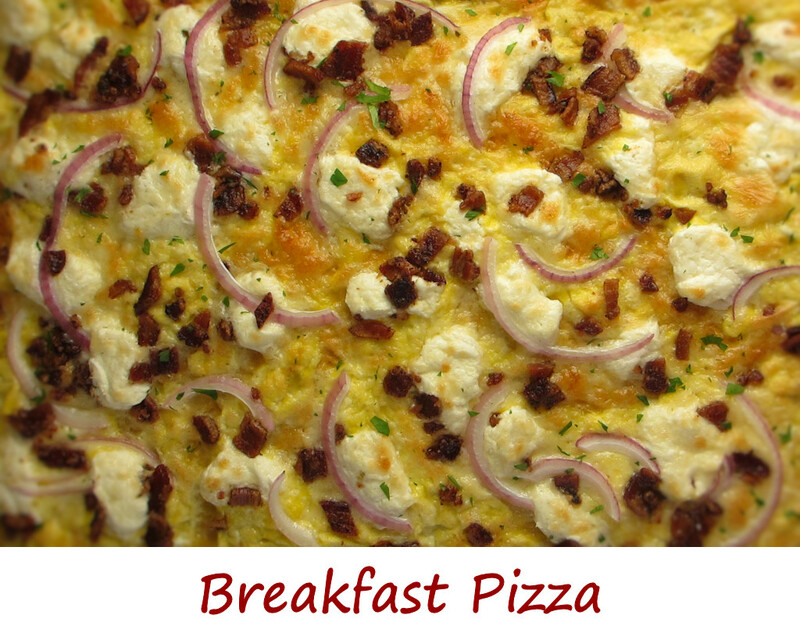 Use my version of breakfast pizza as sort of a canvas for whatever you want to do. You can’t mess it up. Also make my breakfast po boy and my egg McMuffin casserole. Open dough and prepare per package instructions but bake only 4-6 minutes until the crust just starts to ge crusty. Remove from oven. Cook bacon over medium heat in a large skillet. Drain all but 1 teaspoon of the drippings. Add eggs, lower heat to medium low, and cook, stirring constantly, until just starting to set. Remove from heat and sprinkle egg over cooked dough. Drop cubes of cream cheese onto crust. Add the pepperjack, red onion and bacon. Return to oven and bake 10-13 more minutes or until the cheeses have melted and the crust is crunchy and golden brown. Remove from heat and garnish with cilantro. I absolutely loved these bacon cheese-stuffed peppers. Every bite was full of my favorite things, like cheese and bacon. And a bit of sharp onion and sweet roasted bell pepper. I left the onions fairly crunchy because I was looking for a great crunch (along with the crunch of the bacon) to contrast the soft pepper and gooey cheese. You can cook yours further if you want but don’t go overboard. Crunch here is a good thing. For a spicier version, substitute habanero jack cheese for the cheeses, and use poblano peppers instead of red bell peppers. A sprinkle or two of red pepper flake on top isn’t going to hurt anything either. You can’t go wrong with bacon cheese-stuffed peppers no matter how you change them up (if you do). Also try my sausage-stuffed Hatch chiles. Line a baking sheet with foil and add the bacon. Bake for 30-40 minutes until crisp, turning once. Remove to a paper towel-lined plate to drain. Cut peppers in half vertically. Remove any seeds. Place peppers on a baking dish and fill the halves with the beer. Cover with foil and place in the oven for 20-30 minutes or until tender. Meanwhile, crumble the bacon into a bowl and add the onion and cheeses. Uncover the peppers and pour off any remaining beer. Fill cavities with the bacon mixture and return to the oven, uncovered, until the cheese is melted. What’s better than spiral ham? Bacon-glazed spiral ham, of course. It’s spiral-ham-sale-time here, so I backed up the truck and grabbed a nice big smoked ham. Of course, they’re easy to reheat. And just as easy to glaze during the last 30 minutes. The bacon glaze adds a bit more smokiness, but also some sweetness, a little tartness and a little tang thanks to two different kinds of mustard. You can substitute pretty much any jelly you want, but I’d stay away from ‘darker’ ones, such as blueberry or the like. Go for lighter colors. And don’t be afraid to use a spicy jelly such as jalapeno pepper jelly. You may also want to double the amount of bacon-glaze, serving any leftover glaze as a drizzle over the sliced ham when you serve it. 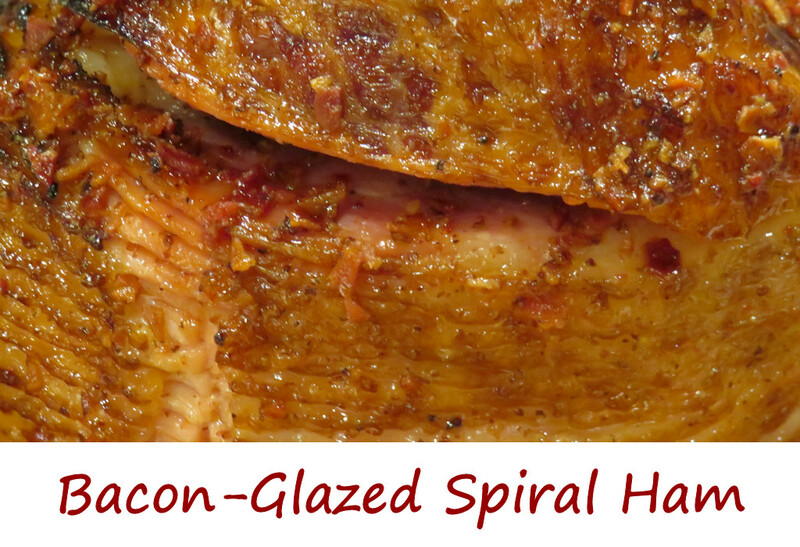 Bacon-glazed spiral ham is a wonderful thing and more glaze is… more wonderful! Also try my cherry-glazed spiral ham. My pepper onion beer sauce makes for a great topping for ham! Warm ham in oven per package instructions. During the last 30 minutes of cooking, apply glaze liberally every 10 minutes. Cook the bacon until crispy in a large skillet. Remove the bacon and all of the grease but keep the yum-yum bacon bits that remain in the pan. Return pan to the stove over low heat. Add the jelly and allow it to melt. Whisk in the honey and the mustards. Remove from heat until ready to glaze the ham.